I hope you all had a fantastic Sunday, and whole week as well. It was kinda ordinary week on Stardoll, which is ok, as I am not yet ready for more limited collections that are actually worth buying. But about that later. Let's see what you did or did not miss last week. It started with a new release in Tress Up hairstyles collection. We got a total of 17 gorgeous hairstyles, with a variety of lengths and types. Prices are kinda high though, ranging from 17 to 27 stardollars. Also, not all of them look good on different types of dolls, and it is a bummer that we cannot still put our Beauty Parlor jewelery underneath them. But as I said, even with those prices and one slight inconvenience, they are really worth investment, as you can easily recolor them and they are really, really fantastic. 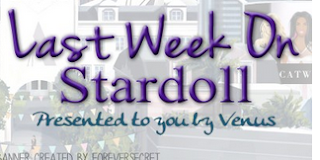 On Tuesday, Stardoll finally announced MSW15 finalists. I don't know about you, but I can only see few dolls I have heard of before, but I gotta admit, almost all finalists show with really elegant, beautiful and unique outfits - mostly formal gowns and finalists sash. No one (I guess) Stardoll members knows yet when the winner will be announced, so I guess many are impatient what will they score. I wish all finalists good luck, and may the best doll win! On Wednesday, we got new Original Future collection. The collection looks kinda cozy. Colors seem kinda well for the Fall, and there are really nice, unique and wearable clothes. You can make a lot of nice outfits using these items, assuming you are fan of that type and style of released clothes. We even have 3 starcoin items - granted, accessories only, but I can also imagine dolls making wonders with that hat, one of the option being using it on mannequins. On Thursday, we got a pretty nice offer for any purchase of either stardollars or superstar membership. You see it well - for any purchase made on Stardoll, like I said before, from Thursday until tomorrow, you will get this gorgeous hairstyle shown on photo above. The hairstyle acts like Tress Up hair in our beauty parlors. It is long, wavy, and it looks really elegant and beautiful. As I was planning already on renewing my membership on the 1st day of October, this was a nice incentive to me. Though I am more a fan of shorter hairstyles, I can definitely imagine my doll wearing it with some nice elegant gown. And on Friday, we got a new Super Supreme collection. Okay, 1st - the previous collection was far from being sold out, so why give us new one? Second, it is just too weird. Surprisingly though, they are all sold out! Was it because of celebrities they presented, or the way they presented them, I have no idea. I wasn't fan of any, I often refuse to buy any interior overall. But overall - too weird. In my opinion, previous collection was nicer. But it has left the plaza without any real warning, so I am guessing some items from the collection are now just too rare and will be really hard to find. And that's all, folks. I hope you loved my recap, please vote and leave a comment as usual, and see you next week.